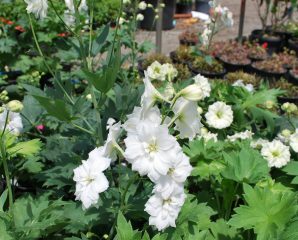 Delphinium (Larkspur) are the queens of the perennial garden having nice cutleaf foliage and beautiful, vase-worthy flowers. Varieties include ‘Innocence’ (white), ‘Blue Butterflies, ‘Pagan Purple’, ‘Pink Punch’ and ‘Cobalt Dream’. We’ve sold a fare share already but there are still a good selection available now. Dan says if you’ve tried them in the past and not had luck with them coming back, it could be that they didn’t establish well their first year. What he suggests is drastic… “cut off the flowers for the first year so all the energy goes to the roots. By doing that, you help build a better root system to help it through the first winter, blooming that much better next year”. Alright then. Echinacea (Coneflower) have just started to bloom. ‘Magnus’, E. purpurea and ‘Cheyenne Spirit’ caught my eye but ‘Powwow Wild Berry’ has been a favorite in past years. Plant in full sun to partial shade in moist, well-drained soil. Deadheading keeps them showy early in the season but leaving the older flowers on in the fall gives the birds a winter snack. Best not to fertilize or they’ll become leggy. Drought tolerant! Hemerocallis (Daylily) Over 25 varieties to choose from – everybody has their favorite. Mine is Mallory Brook. The flower has phenomenal color: iridescent velvety red-orange petals with a deep yellow throat. It’s not a re-bloomer, but who cares. Matt likes the ‘Mauna Loa’ for it’s hot color and ruffled petals and Drew likes ‘Pandora’s Box’, a white rebloomer with the purple eye. Deadhead flowers to keep them neat and cut the flower stalks when flowering is done. The pastel colored flowers tend to like a little shade. Check out the new ‘Entrapment’ – a prolific, lavender rebloomer for full sun! Hibiscus (Rose Mallow) ‘Mocha Moon’ (white) and ‘Mars Madness’ (red) are the two we grow. Each have dark coppery foliage and large, dinner plate size blossoms. The flower buds are just developing – Mars Madness is bright Red and Mocha Moon blooms white. They’re super tropical looking for a Zone 4 plant. Leave them up for the winter and cut back before new growth emerges in spring. Full sun to partial shade in well-drained soil. Liatris (Blazing Star) This summer bloomer will give you both strong texture with its strap-like foliage and vertical purple or white flower spikes that bloom over a few weeks opening from the bottom to the top of the stalk. Dead-heading can prolong bloom into August and September. Plant them in full sun in a very well- drained site, which will help them over winter well. Expect bees and butterflies to come knocking! Monarda (Beebalm) is a favorite for their interesting shaped flowers and fresh minty foliage. Go traditional with the red ‘Jacob Cline’, pink with ‘Marshall’s Delight’ (seen up top) or try its junior ‘Petite Delight’. Also, look at the new ‘Fireball’. It has lush foliage on a compact (15-18″) plant – the flowers will be bright red. As the name implies – bees love them! Soligado rugosa (Goldenrod) ‘Fireworks’ is a good choice for the rain garden and sunny sites that generally have moist to wet soil. No real trick for these – divide if necessary to keep them in check. Another big attraction for the pollinators this one blooming later summer into fall. Birds love the seeds all winter long. They’re just beginning to bud up. Great for the fall garden with the reliable golden flower bursts, beautiful in a rural setting or massed anywhere.